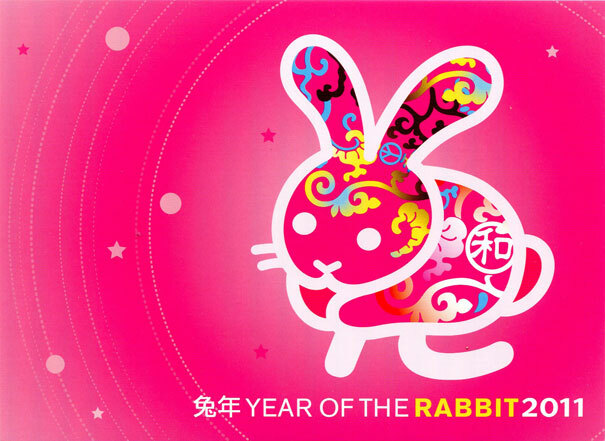 The rabbit (or hare) is the fourth animal in the 12-year cycle of the Chinese Zodiac. 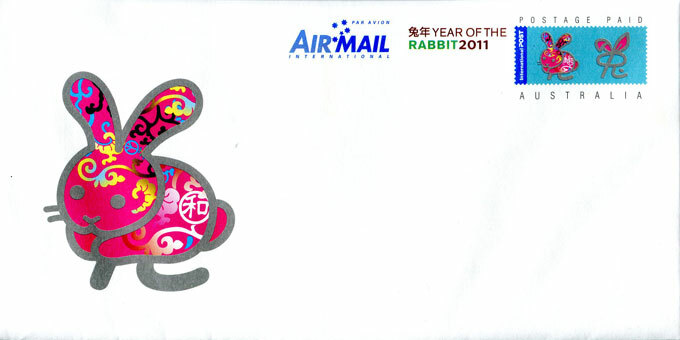 This Chinese New Year is the Year of the Metal Rabbit and runs from 3 February 2011 to 22 January 2012. 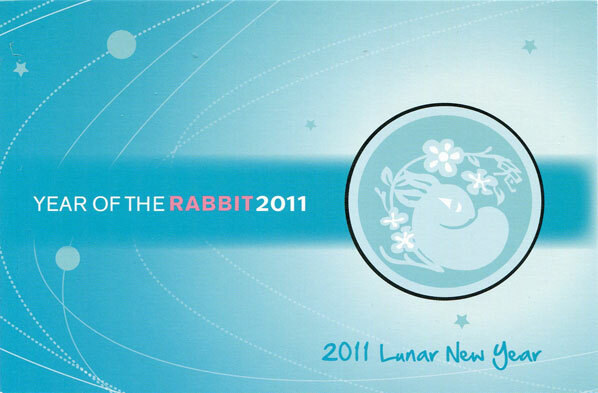 Those born in the Year of the Rabbit are said to be gracious, compassionate, lucky, but can also be moody and stubborn. 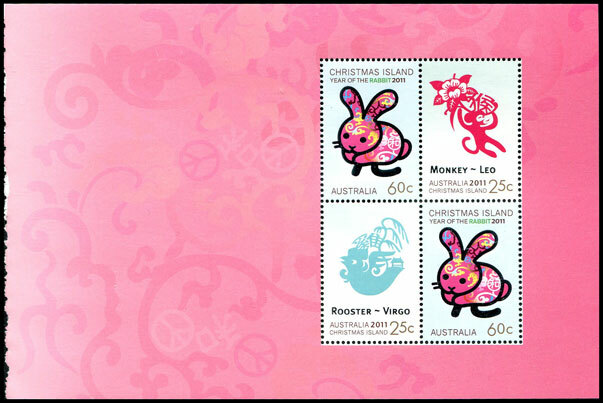 As with previous Lunar New Year issues, this issue includes a miniature sheet, Zodiac sheetlet, postal stationery and this year a new version of the Hawkers' Bazaar sheetlet. 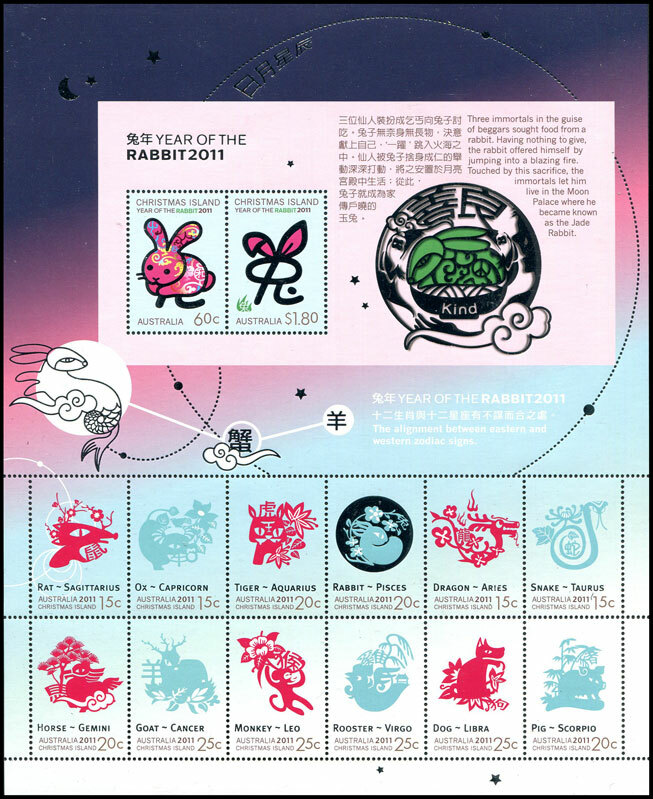 As with previous Lunar New Year issues, there are two sheet stamps, each issued in individual sheets of 50 (two panes of 25). 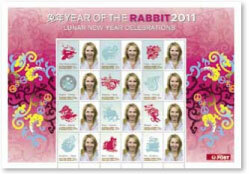 The 60c gutter strip features all twelve animals of the Chinese Zodiac, with the rabbit highlighted in silver. 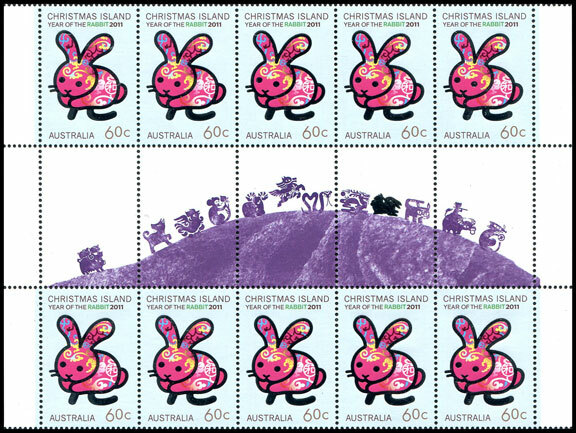 For a day the Australia Post stamp website showed the $1.80 stamp with an illustrated gutter. This image was quickly replaced. The actual gutter pair shows five traffic lights in the gutter; it is likely that the brown is the colour used for the value and country inscription. 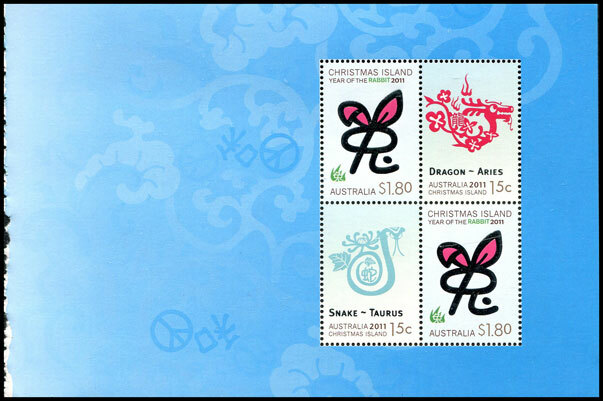 The 60c and $1.80 stamps will also be issued in a miniature sheet of two stamps. 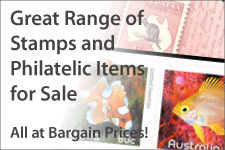 Again, a sheet of sheet of 14 stamps will be issued, and included an 'enlarged' miniature sheet and a block of 12 make-up stamps (four each of 15c, 20c and 25c). Together a 15c, 20c and 25c add to make the domestic rate of 60c. 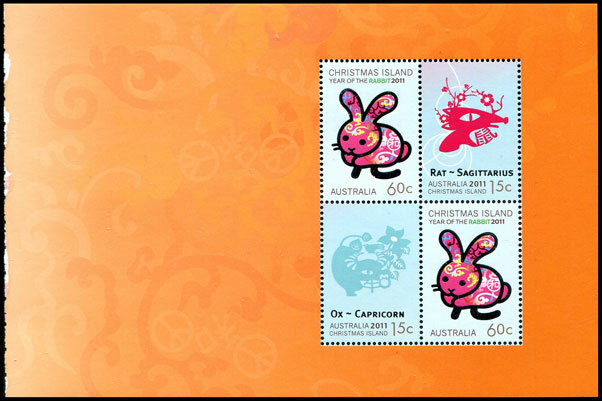 For the second time in this series, the miniature sheet design in the Zodiac sheet has an image variation. 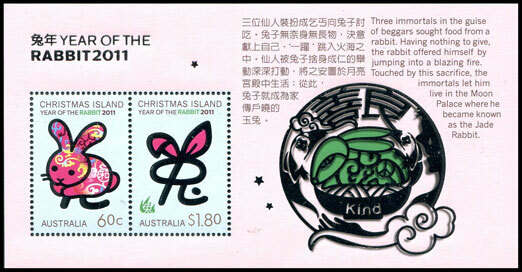 The bottom left hand corner shows the part of the moon design from the surrounding Zodiac sheet. The last time this occurred was in 2009. 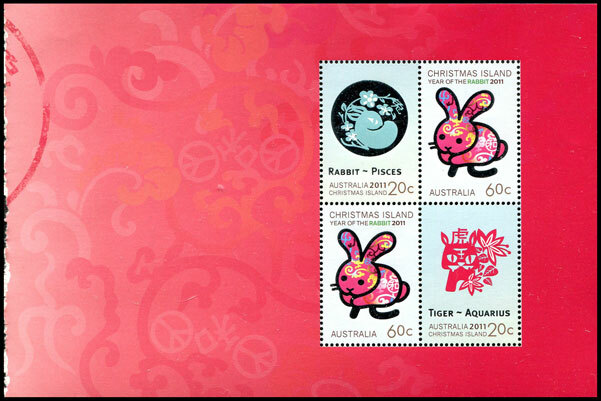 As with previous Lunar New Year prestige booklets, this year's booklet contain six panes, containing a mixture of the twelve low value stamps, in blocks of four with the 60c and $1.80 stamps. 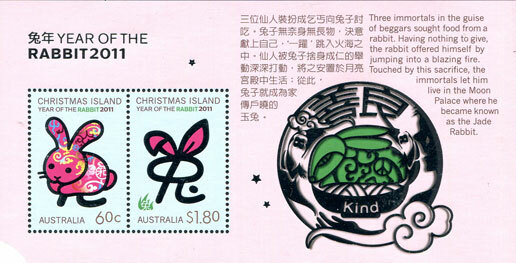 The above six booklet panes were issued in a prestige booklet which sold for $14.95. 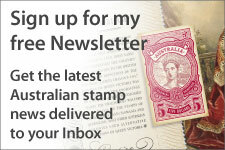 Once again Australia Post will attend the Hawkers' Bazaar at Melbourne's Crown Casino Complex from 4-6 February 2011 (the dates in Stamp Bulletin No. 308 are incorrect). 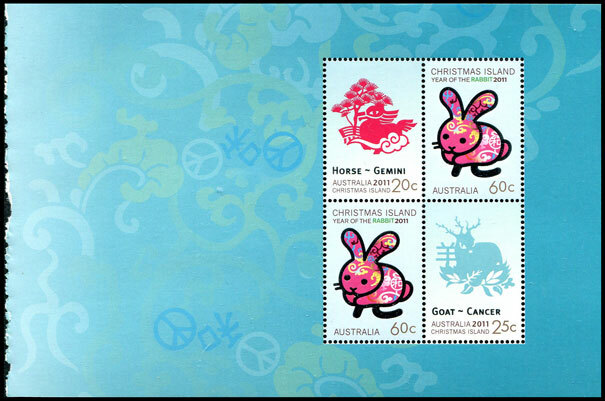 As in 2008 and 2009 a personalised sheet will be issued for the occasion. 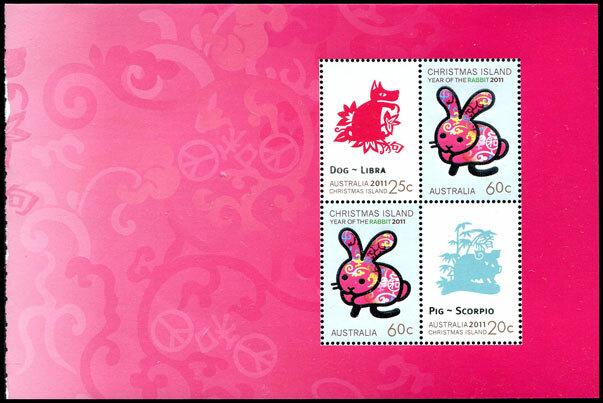 The 2010 sheet differs by containing the twelve low value stamps. 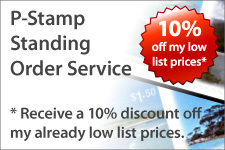 It will be interesting to see whether these stamps are die-stamped in silver or not. A postcard and two prepaid envelopes accompany this issue. 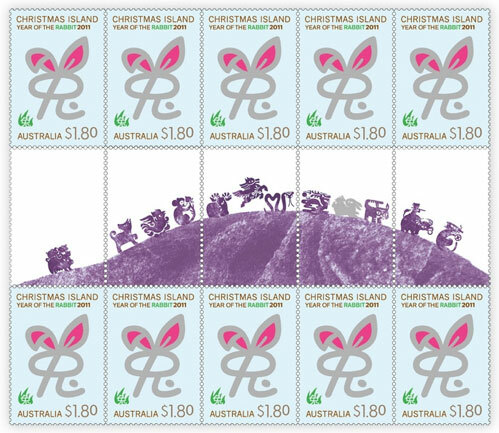 These are actually issued for 'Australia', rather than Christmas Island.